I’m not completely sold on the 2-in-1 hybrid concept. A laptop that becomes a tablet when detached from its keyboard? Who really needs that? But if you’re smitten by the idea, Toshiba’s Portege Z10t is the best execution I’ve seen. It’s not too big, it’s not too heavy, and it packs some serious computational horsepower. 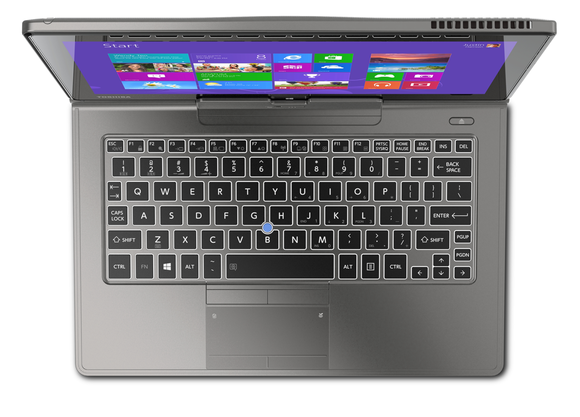 The eval unit Toshiba sent for review (the top-shelf Portege Z10t-A2111) is powered by a dual-core Intel Core i7-4610Y processor (with vPro support), 8GB of DDR3/1600 memory, and a 256GB SSD. It came with Windows 8.1 Pro, which adds some management features that business IT departments will appreciate. The Portege Z10t’s keyboard dock is supremely thin, but its display half is a bit chunky. The device weighs just over three pounds, with two-thirds of of its mass residing in its somewhat thick display. Most of the Portege’s ports—one USB 3.0, a micro HDMI, and an SD card reader—are located in the display. So when you detach it from its keyboard dock, it becomes a truly full-featured tablet that doesn’t need a lot of added-cost adapters. The 11.6-inch IPS touchscreen display delivers a resolution of 1920x1080 pixels, which is adequate for an Ultrabook, but a far cry from the 2048x1536 resolution of Apple’s iPad with Retina display or Lenovo’s ThinkPad Yoga 2 Pro (3800x1200). Then again, the Portege’s processor and storage specs crush Apple’s tablet, and this model boasts an active Wacom digitizer that recognizes 1024 levels of pressure with an eraser feature. A pen holder is integrated into a corner of the tablet, so the pen won’t be easily misplaced. Detaching the display from the keyboard involves a bit of a dance. I also like the display’s matte finish. It’s Corning’s Concore Glass, which doesn’t reflect every object in front of it. A black border about an inch wide runs around three sides of the Portege’s display. The dock side’s border is slightly wider and features a mechanical button that toggles between the Windows Start screen and the desktop. 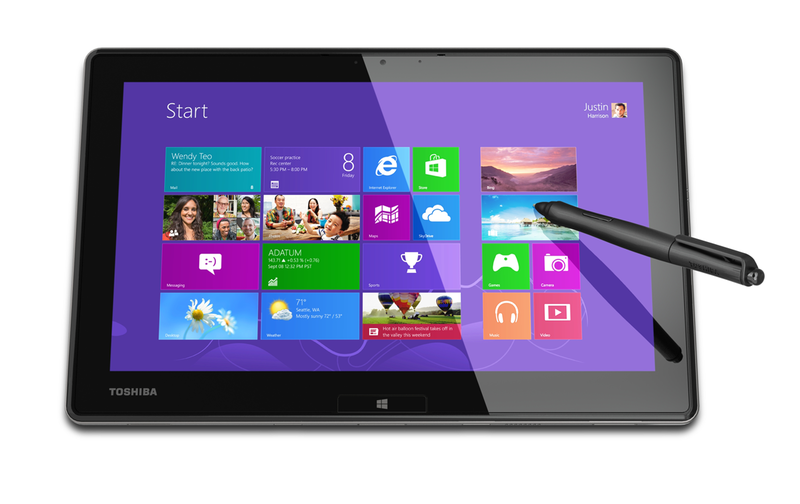 The Portege Z10t has a Wacom active digitizer that can recognize 1024 levels of pressure. The aluminum keyboard is wafer-thin, except for a tall ridge along the back where its docking cradle is located. The cradle has a somewhat limited range of backward movement, probably because the display’s weight would topple the combo over if you tilted it back too far. You can also mount the display backward in presentation mode, so that it faces away from the keyboard, but the two components won’t make electrical contact this way—you’ll need to run on battery power. There is no provision at all for using the display in the dock in portrait mode. Detaching the display from the keyboard involves a bit of a dance, as you must first push an eject button (if there’s USB storage plugged into the keyboard), then slide a spring-loaded button to release the display (I found I had to use my fingernail) while your other hand lifts the tablet out of the dock. The display is enclosed in a stiff resin material that has a textured finish to help you maintain a firm grip. Vents on the top, right, and bottom of the tablet keep things cool. These are augmented by a small, but annoyingly loud fan; fortunately, it spun up rarely and never for very long. The pebbly texture on the back of the tablet provides a good grip. Considering the dock’s thinness, I was pleasantly surprised by the good feel of its island-style keyboard. Most of the short-throw keys are of typical size, but the Ctrl, Fn, Windows, Alt, Shift and Enter keys are about half normal size, while the even-less-used Function, Tab, Page-up/down, arrow, and Del keys are about quarter-sized. This isn’t a keyboard you’ll want to use all day long when you’re deskbound, but it’s pretty good all things considered. There’s a blue eraser-head pointer stick (Toshiba calls it an AccuPoint II pointing device), and a smallish touchpad on the wrist rest with mechanical left and right buttons on top and capacitive mouse buttons at the bottom. The dock has both HDMI and VGA video connections, a gigabit ethernet port, and a USB 2.0 port. Unlike some 2-in-1 hybrids we’ve seen, the Portege Z10t doesn’t have a second battery in the keyboard (although it does have a power socket, as does the display). In addition to the video ports on its tablet and dock, the Portege Z10t also supports Intel’s Wireless Display technology. And 802.11ac Wi-Fi is provided by Intel’s Dual Band Wireless-AC 7260 chipset. 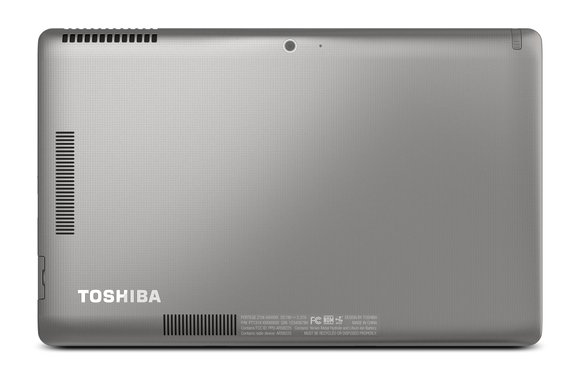 Toshiba made surprisingly few design compromises in the Portege Z10t’s ultra-thin keyboard. Toshiba’s Portege Z10t significantly outperformed HP’s consumer-oriented Spectre x2 hybrid, earning a Notebook WorldBench 9 score of 67 to the HP’s 50. But the HP had a lesser processor (an Intel Core i5-4202Y), half as much memory, and a much smaller SSD. The Spectre x2 weighs almost a pound more than the Portege, but most of that weight can be attributed to its larger display (13.3 inches) and the presence of a second battery in its keyboard dock. 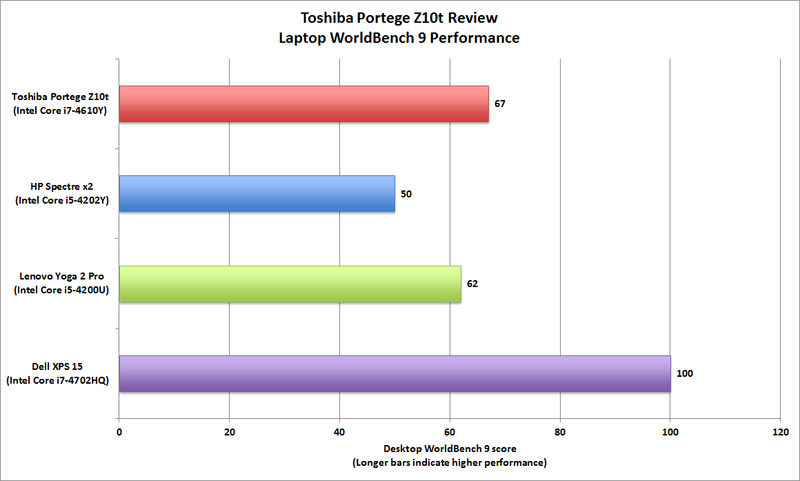 The presence of a Core i7 processor and a 256GB SSD helped the Portege Z10t’s WorldBench 9 performance. The Portege also delivered solid scores on PCMark 8, Cinebench, the audio-editing, and the CPU-based image-editing benchmarks. Gaming performance was nothing special, but that’s no surprise considering this business-oriented machine relies on integrated graphics. Battery life was a medicore 4 hours and 28 minutes. The dual-battery HP Spectre x2 lasted about 27 minutes longer. 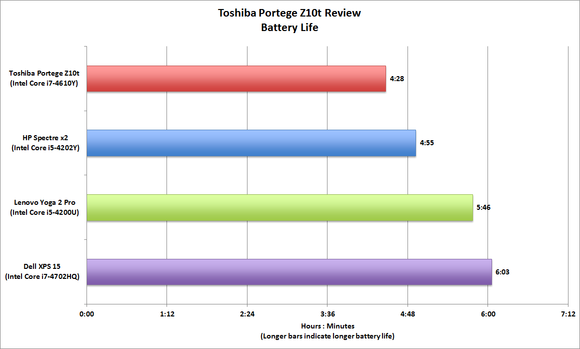 You probably won’t be able to work all day on the Portege Z10t’s battery. As I said in the opener, I’m not convinced the world really needs laptops with detachable displays. 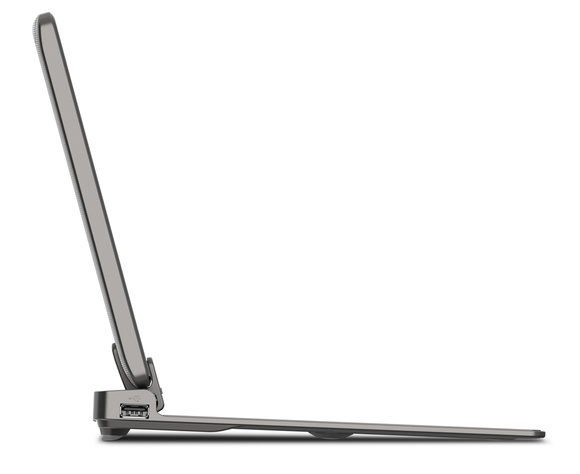 If you really want a notebook that can behave like a tablet, I think Lenovo has a better idea in its Yoga 2 Pro. Lenovo’s machine, on the other hand, doesn’t have an active digitizer or pen. In the end, Toshiba’s Portege Z10t is the best detachable I’ve seen, and anyone who’s sold on the detachable concept will dig it. 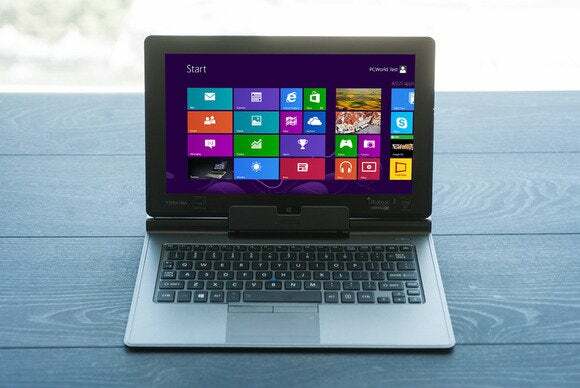 If you really want a notebook/tablet hybrid with a detachable screen, Toshiba's Portege Z10t is the best execution of that idea, at least for now.